The old urban effect, even at minimum quality level, does a lot of texture reading. It needs to iteratively compute the intersection point of your view line with the heightmap, and so needs to read the heightmap quite a lot (if I remember correctly, it might need to read it up to 20 times - most 'normal' shaders read perhaps 1-5 textures). Texture read operations are generically expensive, more so on less powerful hardware. So the urban effect has quite different demands on the GPU than other effects, and there is no reason it should scale like other effects - it is quite possible that it simply doesn't run fast enough on your machine. to separate loading of the tile itself from the objects within the tile. increased road resolution, so you may see a decrease in building density. to the increased computations and had some bugs as well. — Stuart Buchanan (2014-05-14). Re: [Flightgear-devel] cities in FG & how to move forward. 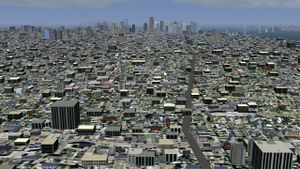 As of 05/2012, FlightGear supports a new "random buildings" feature, buildings are generated at runtime and placed in Urban and Town areas. In v2.8.0 these take up a lot of memory, but in subsequent releases this has been improved significantly. Building generation is configurable through materials.xml, and documented in $FG_ROOT/Docs/README.materials. It is designed to be flexible enough that we can have different types of cities in Europe compared with the USA, or Africa. The current texture used for the buildings is a proof of concept, and we are looking for people with artistic abilities to contribute improved textures. If anyone is interested in creating a better texture, please get in touch with User:Stuart on the mailing list or forums. At a functional level, there are three different size of buildings (small, medium, large), with slightly different constraints (small and medium buildings are never deeper than they are wide, small buildings may have pitched roofs). Various parameters can be set in the materials.xml file, such as the proportion of each building size, the texture file (which is shared across all buildings), and the range of sizes of each building. The actual buildings are then generated by FG itself directly as OSG primitives. The buildings (including the texture to use) are defined in materials.xml, and you can assign different building sizes and distributions to different material types. You can already see that in the difference between Urban and Town/Suburban areas. The new lightmap texture parameter is called <building-lightmap>) but the rest of the parameters are documented in $FG_ROOT/Docs/README.materials if you want to have a play. There's also support for emissive lighting, at present, this only works with rembrandt and the skydome switched off. You'll need generic shaders switched on. fgfs --log-level=debug --log-class=terrain 2>&1 | grep "Total random buildings"
This page was last modified on 29 February 2016, at 18:26.